Ski and snowboard specific stretching routine for at home or the gym! 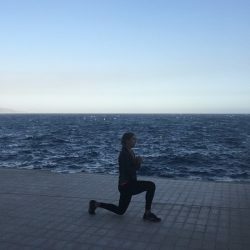 Our friends at Morgan Jupe have their very own personal trainer to hand and have popped together a great stretching routine to help you stay flexible this winter. Being flexible not only makes skiing and snowboarding much easier and more enjoyable but is also very important for injury prevention. Flexibility is one of the most important components of fitness, even more so when it comes to skiing and snowboarding. An enormous amount of force and impact is taken by the lower body when we ski so it is very important that our muscles are in good shape before the trip and that we warm up and cool down the body properly each day on the hill. Before your trip it’s a good idea to incorporate some flexibility training into your workouts to ensure you don’t have overly tight muscles when you come to ski. Just 5-10 minutes a day will go a long way. The following routine can also be used gently as a warm up before the mountain. Stretch out and warm up your hips. Lower one knee to the floor with the other at a 90-degree angle in front. Squeeze your glutes and think and about pushing your hip forward, keeping your back straight. Hold for at least 10 seconds. The downward dog is a great full body stretch which is particularly great for the calves. Place hands and feet on the floor and raise your glutes to the sky so that the body is in an upside down V position. press the heels into the floor and Feel the stretch deep into the calves. From standing position, bring one foot the bum. Standing on one leg, keep the knees together and push the hips forward. Feel the stretch in the front of the thigh. 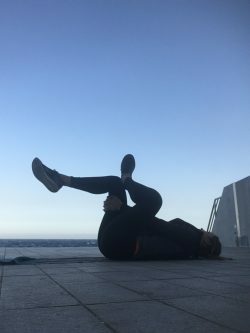 Lying on your back with arms out flat on either side, bend your legs and bring both knees to one side of the body and turn your head to the other. Repeat on other side. Lying on your back, bring one knee towards the chest and hook the other ankle over the knee of that leg. Increase the stretch by bringing the knee closer to the body. From standing position, keep your legs straight (soft knees) and lower your hands towards the floor. Feel the stretch in your hamstrings in the back of your legs. Relax your back and feel a light stretch here too. Check out our other blog from Morgan Jupe , helping you get ski fit for your ski holiday this year. 7 exercises to incorporate in to your gym routine or simply do at home!